Solar today is free for all, but we are caught by a group of fossil fuel salesmen, aided by banks that clearly have an interest to channel the resource to their own best advantage. We moved beyond solar to fossil and we are now moving back at an accelerating pace. Solar electric panels entered the scene in the 70s and where held back by Shell for a considerable time. Prices would have dropped and investment would have flooded in much earlier if fossil interest had not worked hard to slow it down. Today PV (photovoltaics) projects go by the Megawatt, installations on roofs and on land and water are enormous. Today Tesla, the electric car company, announced it wants to fuse with Solar City, a solar installation company. Solar City is planning to use more panels of the company Silevo who are producing a different type of cell than is common from Chinese manufacturers. There’s innovation everywhere, and especially in Tesla and Solar city the drive to optimize is strong. The Model X was made to service the demand for SUVs. It was a lesson in manufacturing. Elon Musk uses the ‘reason from physics’ approach to problem solving. This means that not the actuall present situation or method is taken as a starting point, but what is physically possible. The creation of a car is the question “How do I arrange the metal, plastic, etc in such a way that I have a car”. The cost of the metal, raw materials are the base cost of the car. Optimally there is a minimal difference between those cost and that of the car. Of course when you look at the cost of the aluminum of the Tesla you can wonder “How do I get the aluminum at the start of the production process from any possible source”. This may lead it to talk to the mines, logistics companies, aluminum smelters so that the cost of the aluminum drops and so the cost of the car can drop also. There are physical limits to optimal mining and smelting would create a clear goal to strive for. 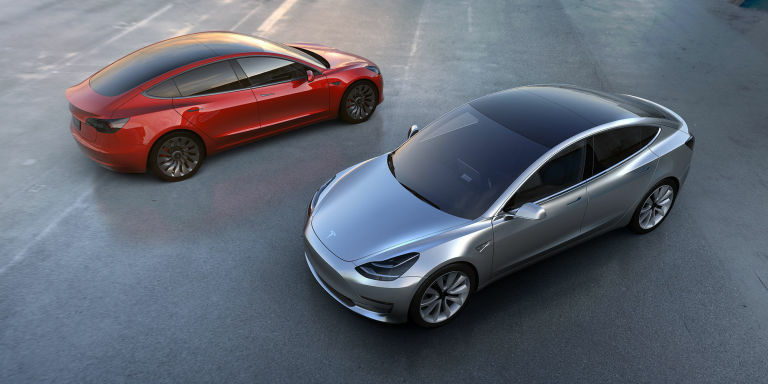 The Tesla Model 3 will be the opposite of the X, a study of optimizing production. More than 300.000 have been ordered. The goal for optimization is to require less resources and create a product in less time so that demand can be met, but also so that the effect of the products can be realized. The sooner more electric cars are on the road, the sooner our air will become cleaner, and the sooner people will expect more of them, learn they are enjoyable etc. 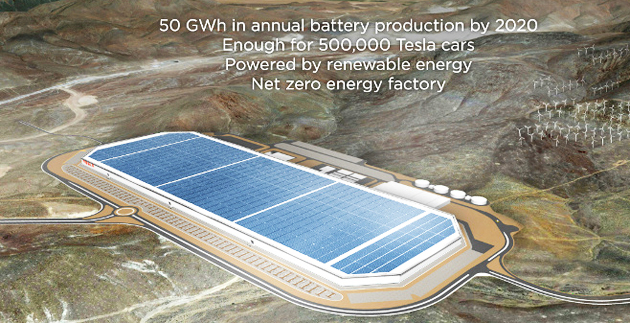 As part of that process Tesla is building the mega battery factory in Nevada that will double the worlds capacity to make batteries when it goes live (although the worlds capacity to build batteries elswhere will have increased). Part of that factory is a huge solar power plant on its roof. The energy it produces will power the plant and perhaps charge the electric cars of the employees. Perhaps it will power the trucks bringing in the raw materials. Those Giga factory solar panels however do something else : They lower the cost of production of batteries. The question can be : where does that need to stop? The answer is : It doesn’t. Renewables in the production chain can lower the cost of running it to zero. You can compare it to the solar powerplants in the leaves of trees. They power the process of building the trees, growing the flowers and fruit (if it is fruit bearing), and the whole organism extracts resources and gets help from nothing outside itself but the sun and environment. The Powerwal is a way to have a power backup in house, store solar energy. It can cycle 10.000 times. Like the tree a company can become a mechanism that operates without need for anything else but the raw materials, and if the mechanism extends to the mines it can operate without need for anything else but access to those mines. As long as it produces enough energy it can trade that away for anything else it may need, but it will not be needing money to buy anything. The oil industry has operated like that for a century. You may think they need money, but they dont, they only need their product oil (or gas or coal) and they can sell it for anything they may need. That has been the reason fossil companies are so hard to stop, they don’t depend on cooperation from outside. If Tesla/SolarCity decide to convert their entire production chain in one that they can power themselves, with raw materials they can either get themselves (from owned ground or from a modest consession) and they produce energy in surplus which they can use to aquire whatever they may need to keep going, the cost of their products can go to zero. This is true for any operation, but Tesla is a nice example of how optimization is applied to its maximum effect. That day will come, because Tesla is a tree that bears fruit people want. They will pluck the model 3 and the model 4 as they do the Roadster, S and the X. If Tesla optimizes its production process increasingly the cost reduction is caused by a lack of necessity for money. This is a logical evolution, because it makes sense that any automated process will become like organic processes. The integration of solar into the DNA of production chains will blend automated, robotic, productive environment into the background of life as we know it. Renewable energy will make mechanized systems equal to organic ones..
After a century of fossil fuel slavery, of suboptimal solutions to real problems, of economic expansion and useless waste of energy to provide business to banks and energy companies, we will find that solar (and other renewable energy sources) provide a permanent path of ascension to a nature compatible mode of existence for humanity. In order to accelerate that we can expect zero cost solar from Tesla. It will happen.